Extra sewing room - With all of your essential features! The Horizon Memory Craft 8200 QC Special Edition offers creativity and control right out of the box. 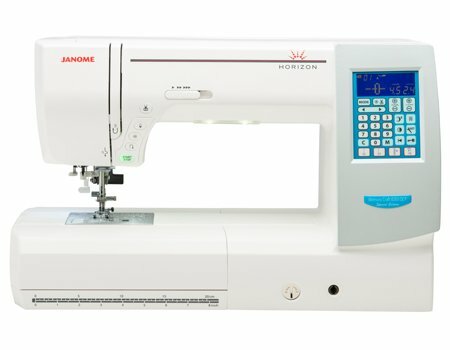 The New Janome Memory Craft Horizon 8200QC Special Edition combines practicality with an exciting range of easy to use features. This machine is consistent and reliable for all your sewing needs with the luxury of added space. The sheer length of the arm space is impressive at 11" ( 280mm )and is ideal for large quilts, bridal dresses and those bigger home furnishing projects. And it's powerful!. Reaching speeds of up to 860 stitches per minute. Nevertheless even at those speeds stitch quality is a priority. With a built-in AcuFeed system for precise fabric handling. Shadow free lighting is provided by 5 bright white lights while quick and easy stitch selection can be made on the large touch panel. Choose from over 224 stitches including alphabets and numbers, including some great fun play stitches. 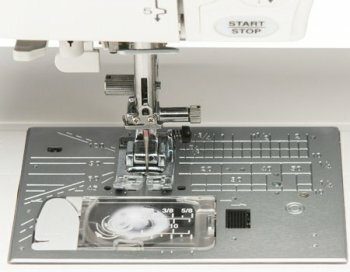 Other special features include an automatic needle threader, speed controller to set your maximum sewing speed and stop / start button if you choose not to use the foot control. It also has a needle up / down button which programs the needle to either finish in the up position or in the fabric. Great for pivoting on corners. 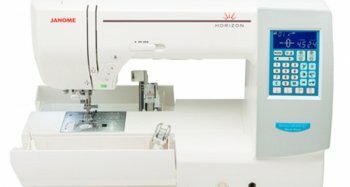 It has a lock stitch button to ensure every stitch pattern is locked off at the end and even an automatic thread cutter to trim your threads.